For those products which are sensitive to moisture, dry heat pasteurization is an alternative. Using carefully controlled heaters, Cosmed Group, Inc. can raise the internal product temperature to the target temperature and hold the product at that temperature for hours, or even days, until the pest of concern has been eliminated. 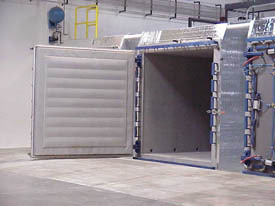 Dry Heat pasteurization is often the best choice for eliminating pathogens and insects when other technologies have failed.